Who was Nicholas Rieussec? Well in 1821 he created a chronograph for horse racing, using two discs and ink. A piece created first and foremost to satisfy a need, Rieussec had a pair of indices with ink-filled nibs above two rotating discs. When the button was pressed, the inked nib would touch the disc, leaving a mark and allowing the timing of racehorses to the nearest quarter of a second. In 1822 he patented the manufacture of a chronograph, and this was thought to be the world’s first chronograph until recently, with Louis Moinet’s announcement rewriting chronograph history. 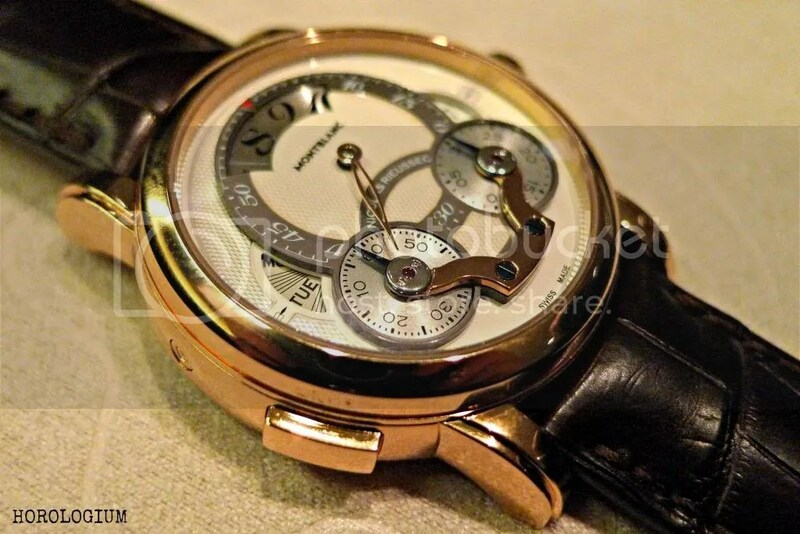 Montblanc have paid tribute to him with previous Rieussec models with two discs, and this year’s model, which I had the opportunity to see at SIHH 2013, is the Rising Hours. This new model has the hours and minutes on an off-centre dial, digital hour with day/ night indicator, a date and day display via disc and a travel function with fast setting of the hour and date display. The chronograph has two counters for 60 secs and 30 minutes, which means that the only hand is for the minutes. The hour aperture at 12 o’clock contains an engraved numeric display that shows both the hour and the time of day, the latter thanks to a second disc that changes the colour of the Arabic numerals depending on whether it’s day (black) or night (blue). This digital direct read is not a ‘jumping hour’ as an hour change does not involve a precise ‘jump’, but a ‘wandering’ or ‘floating’ hour. The dial is anthracite (stainless steel model) or silver, with a beautiful grain d’orge (barleycorn) guilloche pattern. A grey minute sits off-centre at the top of the dial. 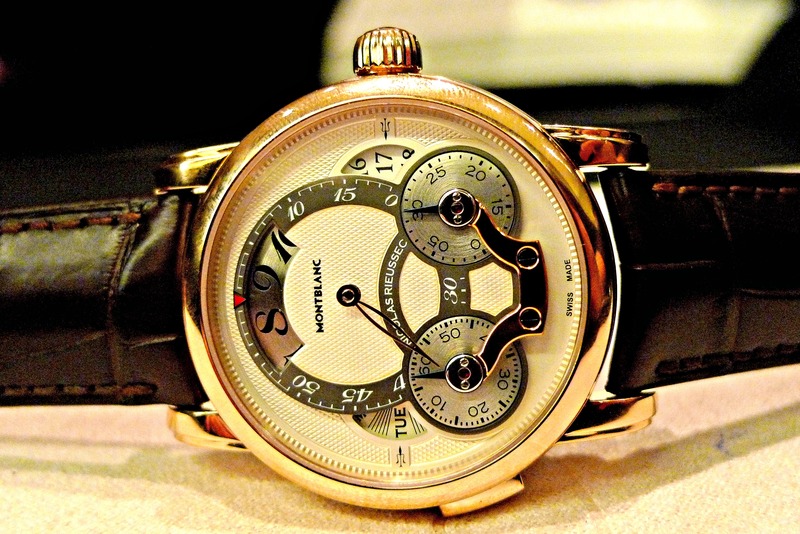 Inside the Montblanc is the automatic Calibre MB R220 with a 72 hour power reserve. 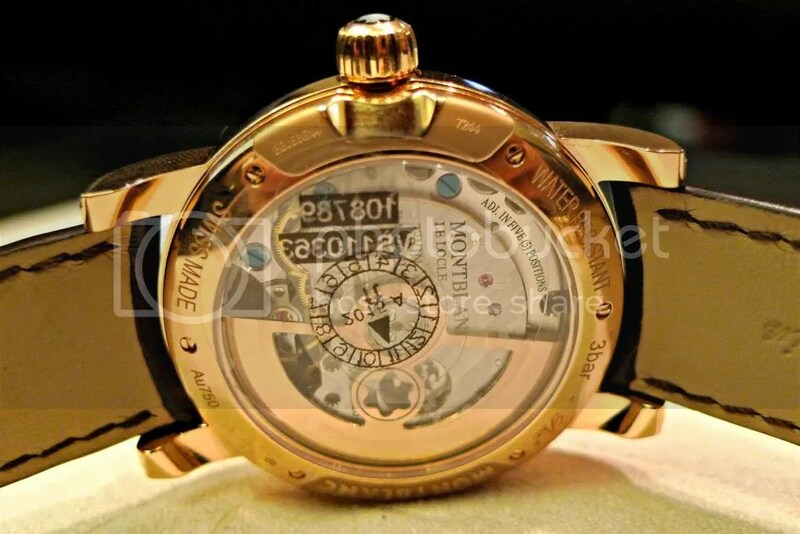 It is rhodium-plated with circular graining and can be seen through the sapphire caseback. At 43mm with a height of 15.3mm, it comes in three models – a limited edition (28 pieces) platinum model, a stainless steel model, and this one, in red gold. This is not an insubstantial watch, but it doesn’t sit too largely on the wrist. The Nicolas Rieussec collection is a striking one, but the Rising Hours, with its use of wandering hours, and particularly their engraved aspect, is to me, the most aesethically appealing model to date.